A to Z Chiropractic is a family-friendly place, with patients of all ages seeking the natural healing of chiropractic care. We will warmly welcome you when you arrive, then invite you to relax in our comfortable environment before seeing Dr. Zach or Dr. Ashley. 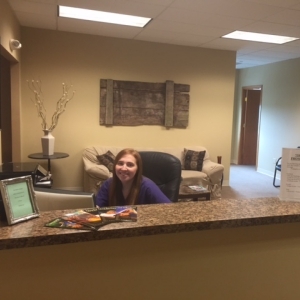 Our massage therapist Abby will greet you at the front desk and get you set up with the necessary paperwork. These forms can also be emailed to you before your appointment, or you can download them on our website and bring them in completed. You’ll see your chiropractor, who will discuss your complaints and any previous chiropractic experience you may have had. We’ll explain to you what our approach to care is and why we’re different. Next, we will complete a thorough exam involving a posture analysis. We’ll relate the problems you’re having to your spine and how chiropractic will address these issues. Then, you’ll receive your first adjustment and be on your way in about 30 minutes. On your next appointment, we’ll discuss how you felt after your first treatment. You’ll receive a report of your chiropractor’s findings from the testing done on your initial visit. We’ll go over any home exercises or other things you can do on your own time to help your body heal. This appointment takes about 30 minutes. The following appointments are shorter and take just 15 minutes to complete. Feel better starting today. Schedule your appointment with our friendly, helpful team! Free parking is available on-site.